For MoneySend to work, it has to be linked to a MasterCard debit, credit, or prepaid account from a bank that offers the service. 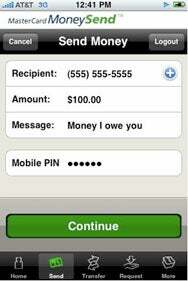 If the iPhone owner’s bank does not issue a compatible card, then they can sign up for a prepaid MoneySend card and account with Bancorp Bank. In either case, they will need a U.S. mobile phone number. Sending money costs 29 cents for transfers up to $50, 99 cents for transfers up to $200, and $2.95 over that. There is no charge for receiving money. The maximum amount of money a user can send with MoneySend is $2,500 per month, according to a MasterCard FAQ. The card companies are slowly stepping up their mobile efforts in developed countries. For example, MasterCard also offers an iPhone application called ATM Hunter, which lets users find the nearest ATM using GPS. Soon, competing card company Visa expects to begin trials of a contactless payments system for Apple’s iPhone, using a special case for the phone developed by DeviceFidelity.